The community in Yamhill County has rallied around their local DHS office in incredible ways! They have begun monthly DHS hospitality events to take the time to show their DHS employees how appreciated and valued they are! Community members, faith communities, and local businesses have all been getting involved to show DHS love and support through hospitality and meeting tangible needs of children in care, by donating a stroller to a single mom as her kiddos were being reunified, providing changing tables for visitation rooms, and even outfitting the visitation kitchen with brand new cookware so that families can prepare meals together during their weekly visits. 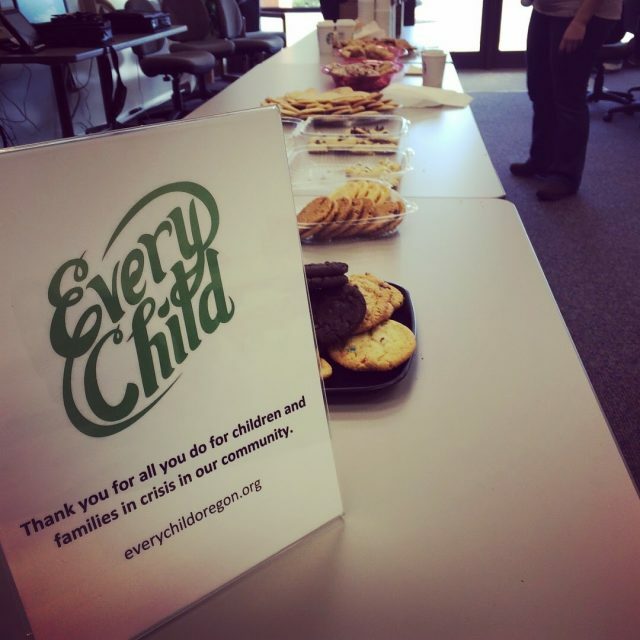 The folks in Yamhill County have also been cleaning DHS visitation rooms, regularly stocking the snack pantry and donating Welcome Boxes and Launch Boxes to support vulnerable children in their communities. A DHS worker took a moment to share their appreciation after receiving coffee, muffins, and thank you’s, "I want to take a moment to express our appreciation for the coffee and treats you recently provided DHS staff. I am truly amazed by the dedication DHS workers have to keeping children and families safe, while being faced with an extraordinary amount of work. I have a new level of appreciation for folks like you who reach out to say thank you and provide a little something special for their day. Thank you for the support!" This county has also been hosting monthly Foster Parents Night Out (FPNO), hosted through a partnership with local faith communities at students at George Fox University. FPNO gives foster families some much needed respite and time to care for themselves while their children have a night full of fun and games. The generosity of folks in Yamhill County is nothing short of inspiring!